Jeremy qualified as a Chartered Certified Accountant in 1993 and was one of the founder partners of Grant Harrod and Grant Harrod Parkinson in 2003 before the merger with Lerman Jacobs Davis in 2014 that formed GHLD. With a client base consisting of self-employed people from a range of professions as well as partnerships and a large number of limited companies, Jeremy excels in business advice, guiding his clients through the challenges of accountancy, audit, tax and statutory matters. 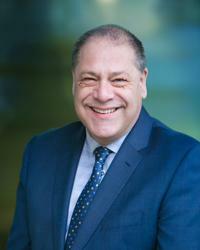 Jeremy has developed a particular specialism in the charity sector, working for a number of well-known not for profit organisations, providing both audit and non-audit services, as well as advice to Trustees on governance and stewardship. He particularly relishes the challenge of working with charities as they require specialised skills not generally found in High Street accountancy practices. Jeremy is married to Rosemary and they have two sons. He sits on the board of management of his religious community and as a keen sportsman enjoys a regular squash game, boxing and watching cricket. A season ticket holder at QPR, he also tries to get to as many away games as he can. "Having a good and reliable accountant is like having a good and reliable doctor."